The Fall/Winter 2011 issue of <i> Research at RIT</i>. Many experts argue that a key to reducing our reliance on petroleum-based products and promoting the creation of a green economy is the fuel cell. Through a series of research initiatives, RIT is helping to develop the next generation of fuel-cell technologies that will power our automobiles, homes and businesses. 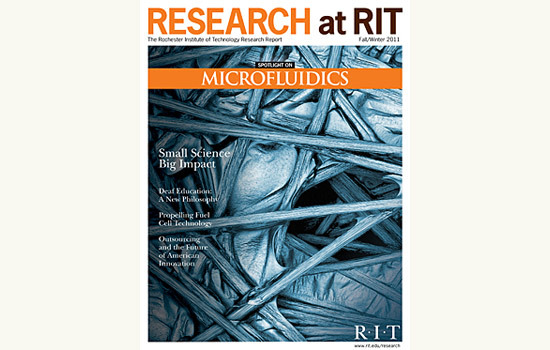 The Fall/Winter 2011 issue of Research at RIT, published by RIT’s Office of Research, spotlights a host of faculty and student efforts in fuel-cell design, commercialization and education. Stories highlight research projects in microfluidic analysis, polymer chemistry, material fabrication and real-time simulation and how these advancements can improve the performance and application of fuel-cell technologies. The magazine also features an overview of fuel-cell commercialization efforts, transportation policy research and education and professional training all designed to assist in the transformation of our energy infrastructure. “We are focused on enhancing the development of the technologies, business practices and public policies needed to ensure the widespread adoption of fuel-cell systems,” notes Donald Boyd, RIT’s vice president of research and executive editor of the magazine. To further promote fuel-cell development, the Office of Research also is hosting a scientific forum featuring local and national leaders in the field. The Forum for University and Energy Leaders, or FUEL, will be held from 8:30 a.m. to 1:30 p.m. Dec. 3 in RIT’s Center for Student Innovation. The event includes an industry panel, research presentations and a talk by Hubert Gasteiger, professor of chemistry at the Technical University of Munich. To register for the forum, go to www.rit.edu/research/fuel. “FUEL brings together experts from industry and academia to share recent breakthroughs and identify critical needs to advance fuel-cell and battery technology,” adds Boyd. The current edition of Research at RIT also presents features about deaf education and public policies designed to mitigate the negative impacts of outsourcing. The magazine began in 2008 and has previously focused on RIT’s research efforts in imaging, sustainability, biotechnology, energy and modeling. It also highlights national and international awards garnered by RIT faculty and related research conducted by students and faculty throughout the campus. To view a PDF or request print copies, go to www.rit.edu/research.